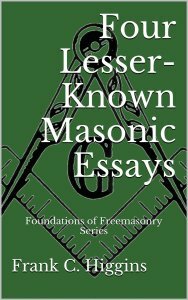 A collection of four essays by noted Masonic scholar Frank C. Higgins. The first explores the labyrinthine paths of solutions that attempt to define the exact character of the “riddle of the ages” that is known as Freemasonry, as it has survived throughout history, in multiple cultures. In his second essay, “Masonic Archeology”, the author picks up where he left off in the first, exploring symbolic clues left behind, across the passage of time, in cultural monuments around the world. In the third essay, Higgins delves into the practice of Masonic initiation, itself. He examines several symbolic elements of our rituals, ranging from the preparation of the candidate, to the removal of metal prior to initiation, to the steps, as well as more subtle and spiritual aspects. Lastly, the author explores the lost Kabbalistic symbolism of the Tetragrammaton, as it is hidden in plain view of the candidate, in the form of the two ashlars, in the East of the lodge room.The purpose of this paper is less to enter point blank upon the labyrinthine paths of solution than to define the exact character of the “riddle of the ages” and hazard a theory of how it may or can, – yes, has been solved. . .